It’s back to school time. Beginning Tuesday, September 4th, kids all over the country will be returning to class so what better time for a design history lesson. There are design motifs that repeat themselves century after century. Take for example, the fleur de lis, greek key or rosette designs that have inspired many an artist, architect or designer. Here is just a brief description and history of these well-known motifs. Greek key: The Greek key is a meandering pattern of both vertical and horizontal lines that repeat themselves as a border. 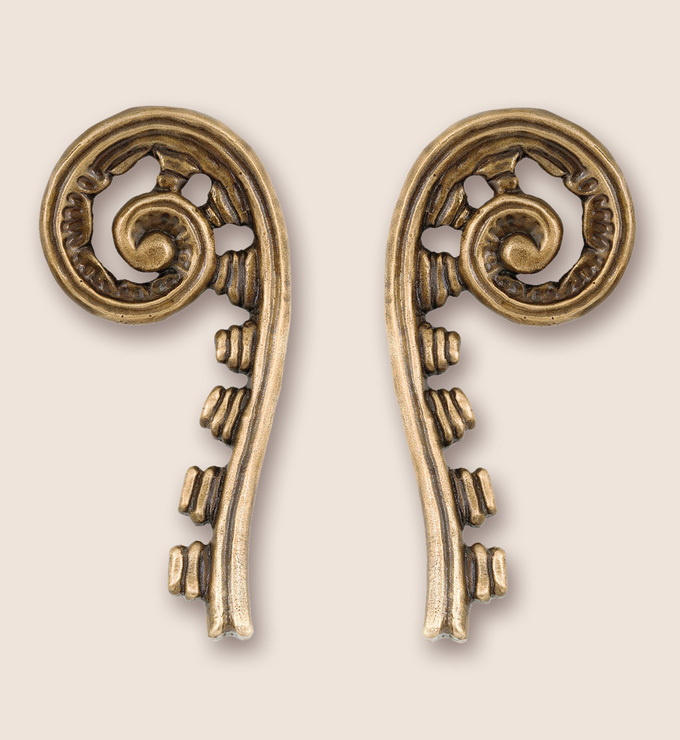 Our Fiddlehead pulls also feature a meandering design on the stem that was certainly inspired by nature. This very popular pattern is often used as trim on fabric and rugs or as an architectural design on a building. Fleur de lis: Loosely translated, fleur de lis means flower of the lily in french. With it’s somewhat regal appearance, the fleur de lis has appeared on many royal coats of arms but has also been associated with military status, as a religious symbol and was even used to identify slaves during the 16th and 17th century. This simple design has adorned many buildings throughout the centuries as well as artwork, home accessories, fabric and hardware. Rosette: The rosette is a round, stylized flower design that, as the name implies, was inspired by the natural shape of flowers. It often appears in architectural designs and is used in metal working and other artistic applications especially where two lines of metal, concrete or other materials intersect. Other uses include military insignias, jewelry design and sculpture. Check out our entire collection of Flora design hardware pieces that might have been inspired by the simple rosette design. If you look closely at an old building, sculptural piece or other type of art you will most likely see one of these motifs used in some form or another. It just proves that good taste never goes out of style. This entry was posted in Uncategorized and tagged custom hardware, custom knobs and pulls, fleur de lis, fleur de lis motif, greek key design, greek key motif, rosette, rosette motif. Bookmark the permalink.